Wera Kraftform Compact 20 Osterei Tool Rebel magazine-screwdriver set 1/4", 6-piece. Wera Kraftform Compact VDE 17 universal 1 bit holder-screwdriver set, 17-piece. 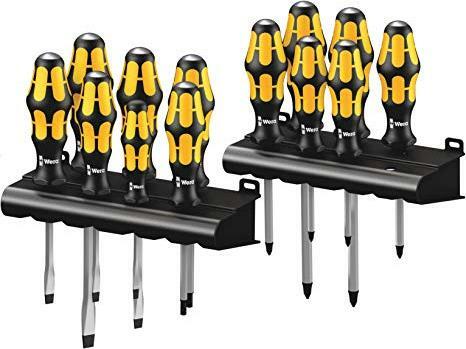 Felo E-Smart VDE bit holder-screwdriver set, 14-piece. Phoenix Contact SF-SL/PH/PZ-SL SET S-VDE screwdriver set, 7-piece. Wera Kraftform Compact VDE 60i/62i/65i/247/18 bit holder-screwdriver set, 18-piece. Wera Red Bull Racing Kraftform Plus screwdriver set, 7-piece. Hazet 804VDE/14 bit holder-screwdriver set, 14-piece.